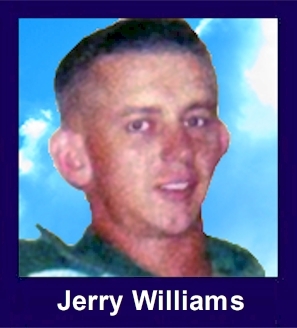 The 35th Infantry Regiment Association salutes our fallen brother, SGT Jerry Hiott Williams, who died in the service of his country on June 24th, 1966 in Pleiku Province, Vietnam. The cause of death was listed as Small Arms/AW. At the time of his death Jerry was 27 years of age. He was from Pickens, South Carolina. Jerry is honored on the Vietnam Veterans Memorial at Panel 08E, Line 90. The decorations earned by SGT Jerry Hiott Williams include: the Combat Infantryman Badge, the Bronze Star, the Purple Heart, the National Defense Service Medal, the Vietnam Service Medal, the Vietnam Campaign Medal and the Vietnam Cross of Gallantry with Palm Unit Citation. Dad, Even after all this time, I wonder what my life would have been like if you had been a part of it. Although I was only 4 and did not really know you, I miss you tremendously. You would be turning 65 this December and would be the proud grandfather of 5 children. I know that you would be happy with the way mom raised us. There can be no greater woman on earth. I guess you know that, because you married her. I have always been proud of you. Buried in the Hillcrest Memorial Park in Pickens. Pickens is located in the northwestern part of SC about 40 miles north west of Greenville. Take exit 21 (Rt 178 north) off of I-85. Go north on Rt 178 about 20 miles to Pickens. Pickens is a small town and information on the exact location of the cemetery should be easy to obtain locally.